This Andalusian style villa is situated in the gated villa neighborhood of Puerto del Capitan above San Pedro and offers breathtaking panoramic views to the coast. 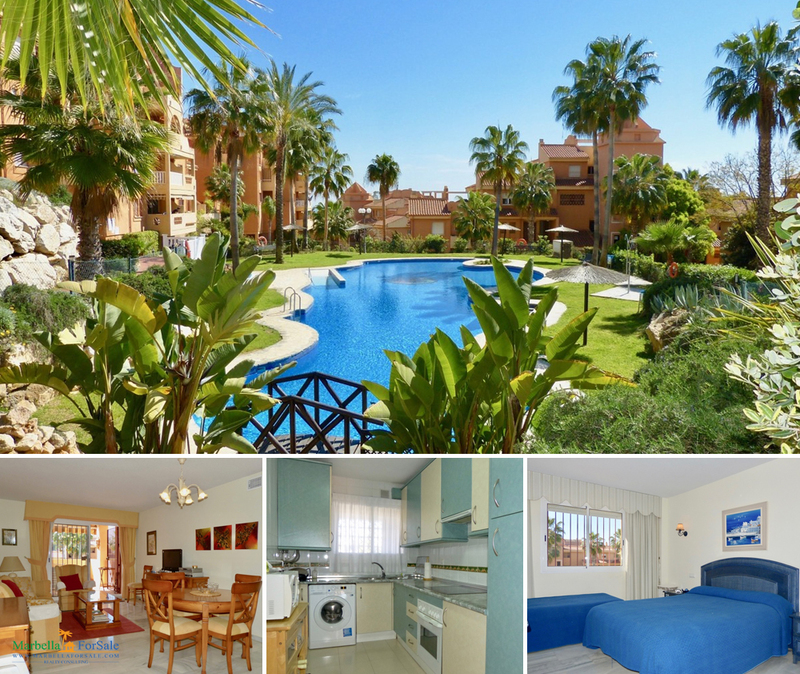 A wonderful opportunity to purchase a first-floor apartment with large terrace in La Reserva de Marbella, just 10 minutes’ drive from Marbella centre. 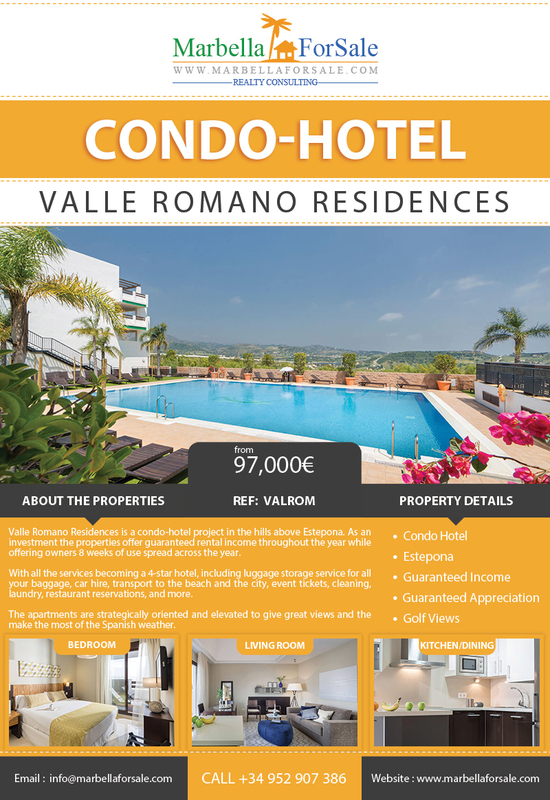 Valle Romano Residences is a condohotel project in the hills above Estepona. As an investment the properties offer guaranteed rental income throughout the year while offering owners 8 weeks of use spread across the year. The apartments come fully furnished down to the last detail and are maintained throughout the year. High-quality apartments fully equipped with no maintenance or supply costs. Over recent years bricks and mortar have been a favourite investment for the Spaniards, the thesis that the price of housing never goes down encouraged many to buy a flat with the intention of selling in the short term to achieve major gains, however, as by noted John Serrano the author of calm investor, a home that is not used is a bad investment and further believes that investing in a home costs more than to invest in the stock market. 1. Housing is a valuable asset but a house that is not used is a bad investment, “You have to paint it , fix it, maintain it, pay for electricity , water and taxes, if we estimate that the annual maintenance cost is 1% of its value, in a hundred years we will have spent on maintaining the property an amount equal to what it cost us. 2. Rented accommodation has been as profitable as shares in the last 100 years and should have earned an annual return of 6.08%, which is the actual appreciation rate of Dow Jones stocks in wall street in the last 100 years, allowing for dividends and adjusted for inflation. 4 . All investors can buy shares but it is not possible for everyone to purchase property, ” it makes no sense that I have three houses to rent and you have three more to rent to me “. 5 . The cost of investing in housing leads many to invest in the stock market, when buying property you pay a 7% transfer tax, on top of that you pay 1% and 3% in registration fees and notary costs. In total the cost ranges between 8% and 10% of the home value but the fees and expenses to buy shares ranges between 0.2% and 0.5%. 6. To buy a good house you need a lot of money, for this reason many people invest in low-quality housing in unattractive areas, which in the long term ends up not being profitable. 7. No housing investment tends not to diversify the majority of investors, they tend to put all their savings in a single investment. 8. To manage a portfolio of stocks is easier than to manage real estate, Serrano points out that buying or selling a home is more complicated and takes longer to do.